FOR THE ATTENTION OF THE HONOURABLE MEMBERS OF THE DELEGATION FOR RELATIONS WITH IRAQ IN THE EUROPEAN PARLIAMENT. THE FIRST ONE IN APRIL 1986 AND THE SECOND ONE IN JUNE 2014. 1- Above is the map where the sub-district of BEŞIR (Basheer or Bashir in Arabic) is indicated. 2-The area in green on the map is where the Turkmens have settled in Iraq 1000 years ago. BEŞIR (Basheer) is the name of a large Turkmen agricultural sub-district situated 25 km south west of Kirkuk whose name has become famous as a symbol of the Turkmens’ sufferings in Iraq after it was mentioned in the Preamble of the new Iraqi Constitution in 2005, along with the names of the Arab sub-district Al-Dujail and of the Kurdish sub-district Halabja, whose populations have suffered the most in Iraq under the dictatorship of Saddam Hussein. Indeed, the ordeals of the Turkmens of BEŞIR (Basheer) under the dictatorship of Saddam Hussein from 1980 up to 2003 have been acknowledged by the legislators and the authors of the new Iraqi constitution as ‘crimes of ethnic cleansing, racial oppression and massacres amounting to genocide, committed against the Turkmens of Basheer’. The history of BEŞIR as a Turkmen agricultural settlement in the north of Iraq goes back to more than 1000 years and its first recorded history goes back to 1556, it is mentioned in the Ottoman registers (Dafter Tahrir of Kirkuk N° 111 of the year 1556 AC) dating back to the reign of the Ottoman Sultan Suleiman the Magnificent and kept in the Turkish Archives in Ankara. According to these registers there were 89 Turkmen families and 9 bachelors living in BEŞIR in 1556, all of them farmers who had been issued official deeds (certificates) registered in their names. After WWI, when the new Iraqi state (the Kingdom of Iraq) was established the deeds and property certificates issued during the Ottoman era were renewed in 1936 and registered as deeds being issued by the Iraqi state. The property ownership situation in Iraq remained unchanged until 14th July 1958 when the Monarchy was overthrown by a coup d’état and the Republic of Iraq was declared. During the early years of the Republic the Iraqi Communist Party and their Kurdish leftist allies became predominant and they influenced the political and social orientation of the regime. The government issued many new laws, among them the ‘agrarian law’ which limited the land ownership to a maximum of 2.000 donums (500 hectares) per family. Many hectares of land were taken from Turkmen families in BEŞIR to be distributed to landless Iraqis such as the Arab nomads and poor Kurds, to help them to settle around BEŞIR. Furthermore in 1968, when the Baath party came to power in Iraq by a military coup, it embarked in a policy of arabization of the Turkmen region in Kirkuk Province, they issued new laws limiting the property ownership to 200 donums (50 hectares) per family (law number 117 of 1970) and more agricultural lands belonging to the Turkmen families living in BEŞIR and in the other Turkmen villages around Kirkuk were confiscated. From 1970 to 1980 the Revolutionary Command Council of the Baath regime issued several decisions by which they confiscated lands belonging to Turkmens, supposedly for the purpose of general public interest (protection of oil fields, enlargement of the military installations, new air base, etc. ), i.e. Decision Number 369 of 1975, Decision Number 824 of 1976, Decision Number 949 of 1977, Decision 1065 of 1978 etc… This is how 1.300.000 Donums (325.000 hectares) of agricultural land belonging to Turkmens of Kirkuk were confiscated (as indicated in the letter from the Judicial Adviser of the Ministry of Agriculture in Kirkuk to the Minister of Agriculture Ref 16784 dated 25/11/2010). All these confiscated Turkmen lands have been registered as ‘lands belonging to the Iraqi state’ in the names of: the Ministry of Finance or the Ministry of Local Administration. In 1982 after the start of the Iraq-Iran war, and despite the enrolment of several hundreds of Turkmens from BEŞIR in the army to fight against the Iranians, the Iraqi security forces arrested hundreds of intellectuals from BEŞIR, accusing them of being opponents to the Baath party and affiliated to the forbidden Al-Dawa Party (Shi’a). In 1984, after summary judgements by a revolutionary court, 93 intellectuals of BEŞIR were sentenced to capital punishment and were hanged and 71 were sentenced to life imprisonment in Abu Ghraib prison, among them young boys aged 16 and elderly men over 60. In 1986 while the young men of BEŞIR, were still fighting on the front in the war against Iran, the Baath regime, not satisfied with the above mentioned unjust punishments of innocent Turkmens of BEŞIR, ordered the expulsion of their families, giving them 48 hours to pack their personal effects and leave their homes. They were forcibly moved to some communal compounds which had been built in a rush to serve as ‘transitional accommodation’ on the road to Tikrit. Their houses were razed to the ground and their agricultural lands were confiscated and were given to Sunni Arabs supporting the Baath regime, in application of a policy designed to arabize Turkmen towns and villages in Kirkuk province. Each of these Arab families were given 10.000 Iraqi Dinars in cash (equivalent of 33.000 USD) as incentive to build their house on Turkmen lands, while the unfortunate Turkmens were displaced without any valid reason or any legal justification and without receiving any compensation. After a year spent in the communal compounds the Turkmen families from BEŞIR were dispersed to cities throughout Iraq: Nasseriyah, Diyala, Diwania, Kut and Erbil, without being provided with housing and without being compensated for the loss of their livelihoods, houses and agricultural lands. From being landowners and farmers since centuries in Iraq, the Turkmens of BEŞIR became refugees in their own country and were left completely destitute. Meanwhile the Baath regime had arabized the name of the village calling it “Al-Bashir” instead of BEŞIR. 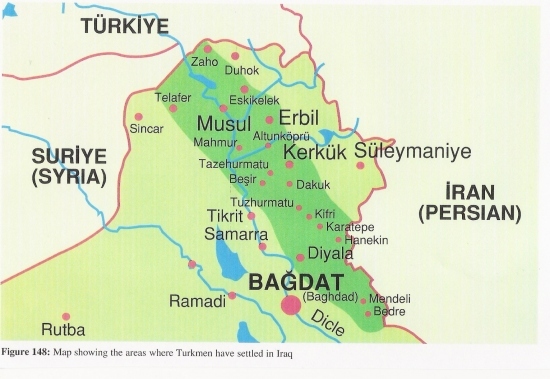 After the regime change in April 2003, when the U.S. military occupied the north of Iraq they did not take control of the area around BEŞIR and the Arabs which had been installed there by the Baath regime remained in the area. The original Turkmen inhabitants of BEŞIR came with tents and camped near the village, demanding the departure of the Arab settlers, they wanted to recuperate their agricultural lands and be compensated for the loss of their properties and loss of earnings since 1986. A Turkmen NGO built 100 houses for the families of the martyrs, which became the nucleus of the new reconstructed sub-district of BEŞIR and little by little other Turkmen families returned and built their houses there. In July 2003 the newly returned Turkmens from BEŞIR wanted to remove the Arab settlers by force, the U.S. occupation authorities intervened, they led and controlled a “mediation” in September 2003, but this mediation did not resolve the property dispute, it was only a ‘short-term agreement’ which allowed the Arabs who had settled in BEŞIR to stay on the land for the Winter agricultural season on a ‘non-renewable basis’, it granted them the Winter harvest. The requirement was that they would leave BEŞIR within one year of the signing of the ‘agreement’. After this one year period the Turkmens would be allowed to return on their ancestral lands. Unfortunately, the Arab settlers did not respect this ‘agreement’ and they refused to leave BEŞIR, despite the new Iraqi government’s offer to give them a sum of money to help them return to the region they came from. To make things worse, they built more and more houses on Turkmen lands. On 15th January 2004, the Coalition Provisional Authority issued Regulation Number 8, authorizing the Governing Council of Iraq to establish the Iraqi Property Claims Commission. Soon after its creation, the Commission created Tribunals to look at the claims presented by the Iraqis who had been unjustly dispossessed. The Turkmens of BEŞIR followed the procedures set up by the Commission and in early 2005 they introduced 1.150 claims to the Tribunals set up by the Property Claims Commission in Kirkuk for their confiscated agricultural lands situated in BEŞIR which had been registered in their names in the official old Cadastral Sector of BEŞIR (Sector numbers 36, 38, 45, 46, 47 and 48). In July 2005 the Tribunals examined these 1.150 claims introduced by the Turkmens of BEŞIR, they found them receivable and justified and they ordered the return of all the agricultural lands to their original owners. Notwithstanding the decisions of the Tribunals being in favour of the Turkmens of BEŞIR, only 350 of the 1.150 claims have been finalized to-date. This shows that the discrimination against the Turkmens continues in Iraq, despite the regime change and despite a special decree (number 59 / 2088) on 3rd October 2005 from the President of the Republic ordering the central and local authorities in Iraq to execute the decisions of the Tribunals of the Property Claims Commission swiftly and without any further delay. Regrettably, the Iraqi Ministers of Finance and of Local Administration, under the pressure of the Sunni Arab political parties, have appealed the decisions of the Tribunals for the remaining 800 claims, arguing that they need these lands supposedly ‘for general public interest’. Consequently, the cases are still pending and the Arab settlers are still living around BEŞIR and exploiting Turkmen agricultural lands. In 2006, under the government of Prime Minister Ibrahim Al-Jaafary, the actual Prime Minister, Dr. Haidar Al-Ibadi, who was his adviser and was nominated the President of a Committee to investigate the Crimes committed against the people of BEŞIR (under the Baath regime) had asked (on 5th February 2006 in a letter ref.MRW/12/2006) the Governor of Kirkuk, Abdurrahman Mustafa, to update him about the progress of the local authorities of Kirkuk in helping the people of BEŞIR to recuperate their lands and to return to their homes. He asked the Governor to send him a report about the problems still faced by the people of BEŞIR. On 30th March 2006, the Iraqi Council of Ministers decided to reconstruct the sub-district of BEŞIR and it allocated 43 Billion Iraqi Dinars (about 32 Million USD) for this project and ordered the Finance Ministry (in a letter dated 2nd April 2006 ref. 8/1/5/4423) to allocate 14 Billion Iraqi Dinars to the Ministry of Reconstruction and Housing for the year 2006 to start the reconstruction. Today, twelve years after the removal of the Baath regime and nine years after the decision of the Iraqi Council of Minister to reconstruct Bashir and despite the budget allocated in 2006 for its reconstruction, not a single house has been built by the Iraqi Government for the Turkmens of BEŞIR, the only realization by the Iraqi Ministry of Reconstruction and Housing and by the Governorate of Kirkuk is a publicity board at the entrance of Taza (near BEŞIR) announcing the ‘Project for the Reconstruction of BEŞIR’. To make things worse for the Turkmens of BEŞIR, the Arab settlers who remained around BEŞIR welcomed the ISIS terrorists when these came to area and they supported them in the attacks on BEŞIR which started on 14th June 2014. BEŞIR inhabitants resisted ISIS attack during 3 days with their small weapons and only little ammunition. Unfortunately, because they did not get any help from the Iraqi forces or from the Kurdish peshmerga, they could not stop the invasion and occupation of BEŞIR by ISIS terrorists. ISIS occupied BEŞIR on 17th June 2014 and expulsed its entire Turkmen population composed of about 1.500 families, totalising about 10.000 people. ISIS terrorists looted all the homes and properties. A few days after they had occupied BEŞIR, they published some videos on their websites, showing the demolition of schools, offices, mosques, religious shrines and the library. To terrorize and humiliate the Turkmens, ISIS published photos of their unfortunate victims, some had been beheaded and their bodies had been left in the open to be eaten by wild animals, and some others had been tied to lamp posts. ISIS has committed war crimes and ethnic cleansing in BEŞIR. During the first three days of their attack they killed 36 unarmed Turkmens. They kidnapped women and children, tortured, raped and savagely killed some of them. A few days after the occupation of BEŞIR, a group of Turkmen volunteers composed of youths from other Turkmen localities (Taza, Tisin, Tuz Khurmatu and Kirkuk) came to help the people of BEŞIR, together they tried to dislodge ISIS terrorists. Unfortunately they failed, 21 were killed and many of them were injured by ISIS snipers positioned in strategic points in and around BEŞIR, armed with heavy long range machine guns. Their task was made difficult because ISIS had already planted explosive devices on the roads leading to BEŞIR and booby trapped buildings and houses in BEŞIR. On 18th March 2015, a Turkmen unit of the ‘Peoples’ Mobilisation to fight against ISIS’ (Hashd al-Shaabi) tried again to liberate BEŞIR, unfortunately they too failed, because ISIS terrorists had time to reinforce their positions in and around BEŞIR, positioning many more snipers with long range machine guns in all the strategic high positions. The Turkmen unit managed to reach the Police Station but they were forced to withdraw after suffering many casualties (5 killed and 9 gravely injured). It is clear that the Turkmen unit of the ‘Peoples’ Mobilisation to fight against ISIS’ with its present day capacity and weapons cannot liberate BEŞIR without reinforcement and support from the Iraqi and/or International Coalition air forces. Unfortunately, to-date, neither has come to their help. During the 23rd March 2015 Meeting of the Iraqi Council of Ministers in Baghdad, it has been decided that the peoples who have suffered from ISIS terrorist attacks in the north of Iraq, i.e. the Christians, the Turkmens, the Yezidis, the Kurds and the Shabaks, exposing them to mass killings and to internally displacement, are victims of ethnic cleansing, amounting to genocides. Concerning the Turkmens, the Council of Ministers has specified that the Turkmens of TEL AFAR and the Turkmens of BEŞIR, have been victims of genocide by ISIS terrorist groups. Thus, this is the second genocide committed against the Turkmens of BEŞIR in less than 28 years. Therefore, we Turkmens of Iraq, call upon the Delegation for Relations with Iraq of the EU Parliament, to support our case and endorse the Turkmen demands stated in the Common Declaration of the indigenous non-ruling peoples of Iraq, (which we presented to the EU Parliament on 19th November 2014) and advocate our requests with the European Parliament, the EEAS, the European Commission and the EU Council. Provide humanitarian aid directly to the remaining 250.000 displaced Turkmens. Provide military training and military equipment directly to the Turkmen units in order to enable them to liberate the sub-district of BEŞIR, the district of TEL AFER and the Turkmen villages around MOSUL which are still occupied by ISIS. Provide material aid to rebuild the homes, properties and infrastructure damaged or destroyed by ISIS terrorist groups in the Turkmen region after it has been liberated. Assist and support the Turkmens in their negotiations with the Iraqi Central Government and the KRG concerning their request for TEL AFAR and TUZHUMATU to be upgraded to the status of Governorates in Iraq. 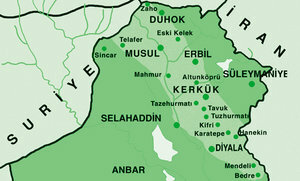 Assist and support the Turkmens in their negotiations with the Iraqi Central Government and the KRG in order to achieve a special status for Kirkuk, whereby the power will be shared equally between the Turkmens, Arabs and Kurds (32% for each of the three main ethnic communities and 4% for the Christian minority of Kirkuk). Assist the Turkmens in their negotiations with the Iraqi Central Government to obtain their fair share of power within the Central Government and their fair share from the Iraqi budget.